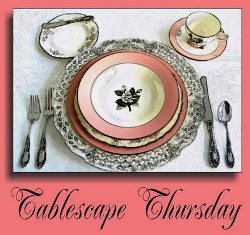 Welcome to the 424th Tablescape Thursday! 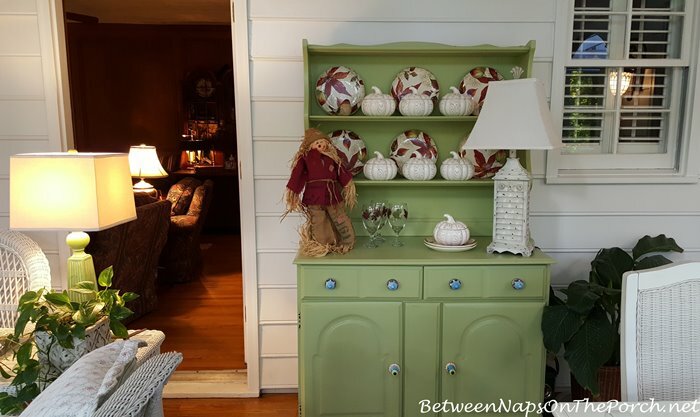 I didn’t get a chance to set a table this week so I thought I’d share how I dressed the porch hutch a few weeks ago. I pulled out some of my most favorite autumn/fall dishes and combined those with cute, pumpkin-shaped soup bowls. The leafy glassware is from Dollar Tree several years ago. I love using it in table settings this time of year. These photos aren’t really doing this dishware justice, it’s absolutely stunning in person! The colors are rich and beautiful! 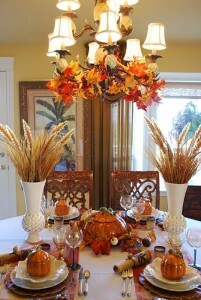 Here’s a better picture from a previous tablescape here: Autumn Table Setting with Roasted Pumpkin Soup. This photo hasn’t been enhanced, the pattern is really this beautiful! I just love it! Fortunately, they have brought it back again this year and it’s currently on sale here: Leaves Dishware. I wish they would never discontinue it. It doesn’t feel like fall here in Georgia right now with the 75+ degree weather we’ve been having the last few weeks, but I know that will soon be changing. Previous PostChristmas Pillow Crazy & Shopping at T.J. Maxx Online! 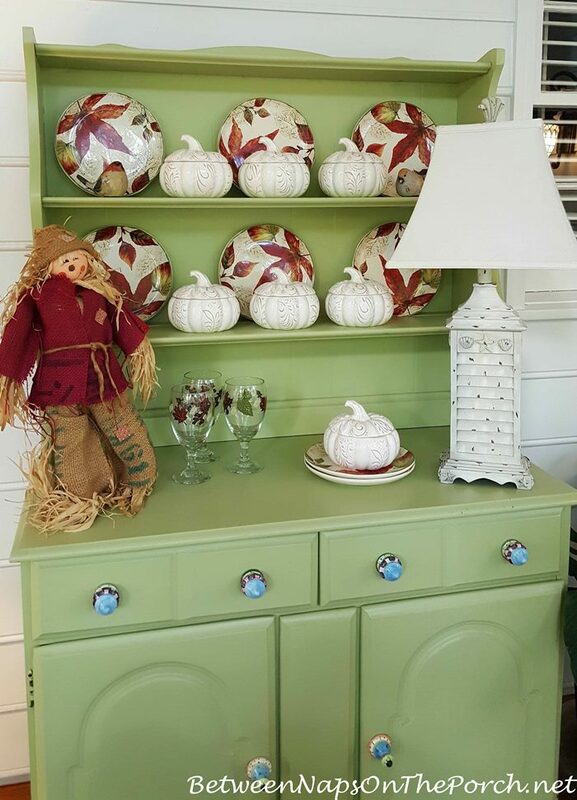 Love how you dressed your hutch for fall. Love those dishes. We are having temperatures around 82-85 here in East Texas so it’s difficult to feel like Fall is here either. I am so ready to turn off my air conditioning. Thanks, Linda! This has been such a weird fall, but I’m loving the warmer temps. I know the cold will be here soon! I love your hutch decorated for the seasons Susan! Your leaf dinnerware is beautiful against the green background! That looks great! 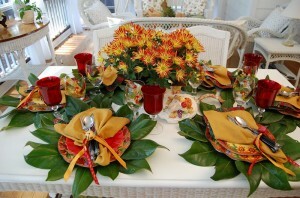 I have those leaf dishes too and they really are striking in color. We’re having pretty warm weather too. This fall has been a beauty for us. I’m relishing each moment since the “S” word is the next thing to happen up here! Thanks, Liz! I know, I am loving it as long as it lasts! Thanks, Pam! Have a wonderful week and weekend! Great party and I love all the links for more inspiring posts. Thanks for hosting………. Thanks, Emily…Happy Fall to you! Thank you Susan, love those pumpkins! 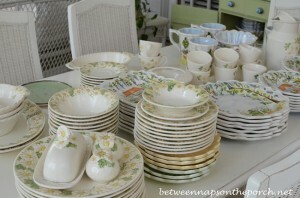 Love, love the dinnerware and glasses! The leaf pattern is so serviceable throughout the fall season! You are so talented! It really is! My fave this time of year. 🙂 Happy Fall, Myra! Thanks for hosting every week! I’ve enjoyed it for years. Thanks for the tip with the dishes…beautiful. Thanks, Nancy! Have a wonderful week! Lovely dish display in the beautiful green hutch. Thanks for hosting Suszn! Wow! I need to get out there and do the same while this weather is so nice. Have a great weekend, Pinky! I am looking for a Hutch exactly like the one you have pictured. Could you please let me know where you have discovered this? I look forward to Thursdays each week to see what decorating “goody” you have for us. I was in touch with you a while back about my upcoming trip to Italy (fabulous, BTW! ), and when we left Memphis, it was fall. We returned to summer! We’ve been up in the 80s since we’ve been home the past week and a half. I really want to wear a sweater! I don’t love winter, but do love the season in between summer and winter. 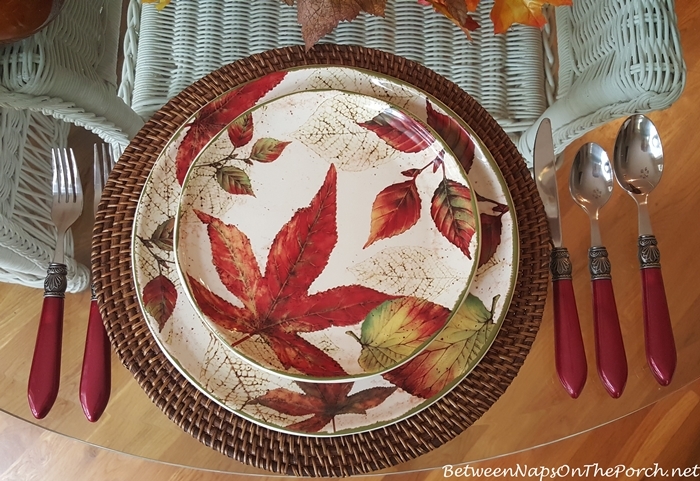 I have these beautiful leaf dishes from Pier 1, too, and have to say they are my favorites! 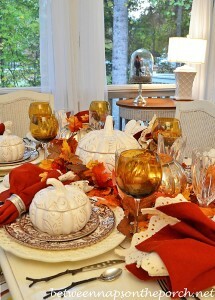 They look gorgeous on your hutch with your pumpkin soup bowls and leaf glassware. I am awaiting to see what you do with your hutch for Christmas and winter. I am going to put plaid and something yet undetermined on mine. You inspired me last year to have a hot cocoa bar, so I’m looking forward to having that on the bottom shelf of mine this winter. I just hope it gets chilly enough to have hot chocolate soon! Thanks for another wonderful TT post, Susan! lol I know, it’s so confusing how it changed back to such warm weather! Your hutch is so darling! Thanks for the party! Have a wonderful fall weekend and weekend! 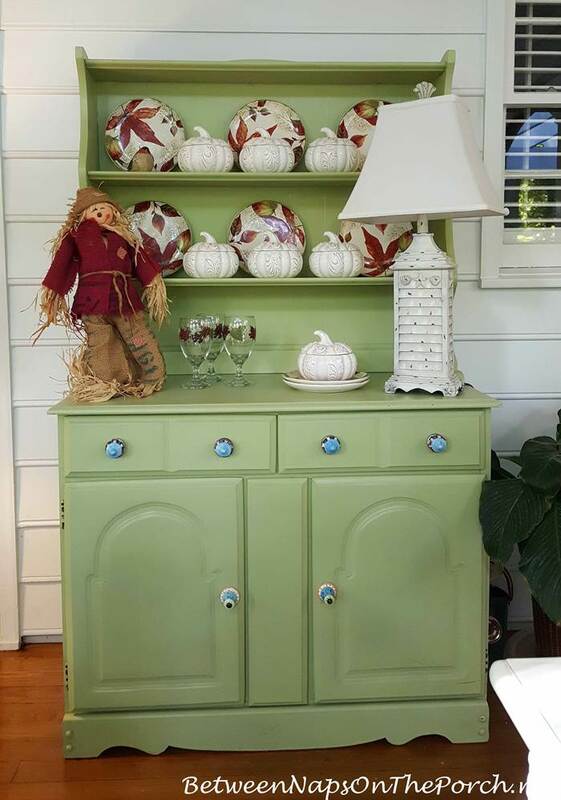 I love yourlittle green hutch, it’s versatile for decorating it. The Fall dishes are adorable too. Havea lovely rest of the week dear. Thanks, Fabby! Sometimes I wish I could paint it white, seems it would be easier to decorate, but white just wouldn’t work against that wall. Have a wonderful week and weekend! Is it as warm at your home as it is here, right now? We’re having the most unusual weather in the high 70’s! I saw these at PierI last year–the leaves ARE more vibrant in person. I had just purchased their Harvest Garden set the year before, so all I could do when I saw these was sigh. Porch view, looking into your living room, looks so cozy. Hugs! Those Fall dishes are lovely. The pumpkin bowls area delight. Thanks for sharing. Hi Susan! I, too, fell in love with the leaf dinnerware. I bought the salads last year, but loved it so much I bought the other pieces just the other day. You’re right, so vibrant and rich. Perfect dishes for Autumn! I also bought the pumpkin set… Loved it too. Pier 1 is a dangerous place around the holidays! Those Asheville Leaves plates make my heart sing every time I see them ! I bought the salad plates a few years ago with a gift card from work – once I got it, I knew what store I was going to and what I was buying! They look so pretty with my rattan chargers and look great with my red Spice Route plates from Pier 1, as well as solid orange, brown, and mustard yellow plates, and especially with Mikasa Italian Countryside, which is our everyday pattern. 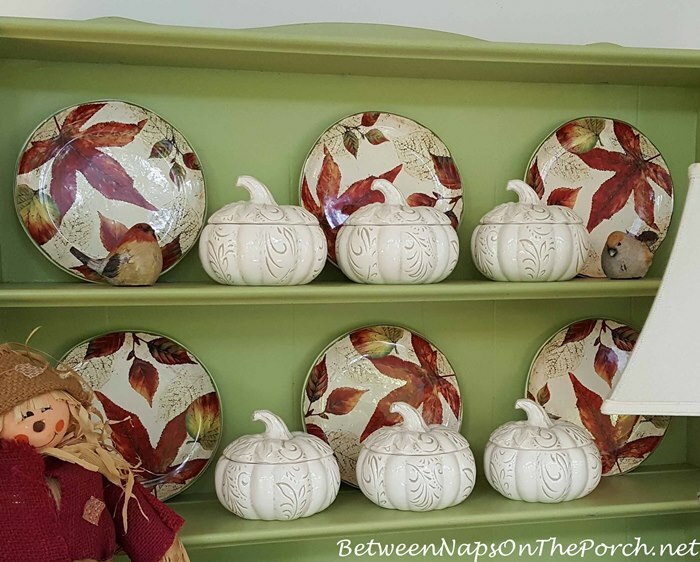 I use them to set our table for two in the kitchen and hang the other two on the wall on a pretty plate rack that I update seasonally. I need to get them down from the attic this weekend when I switch out the fall décor from the Halloween stuff! The porch looks lovely with the inviting view inside your warm and cozy family room! I also have the leaves pattern, but only the centerpiece bowl – about 12″ in diameter. It sits in my living room on the coffee table from Labor Day until we decorate for Christmas in early December. I love it as well! I love the hutch and all the dishes, the Dollar Tree stems are especially pretty, actually all ideas and décor are lovely!